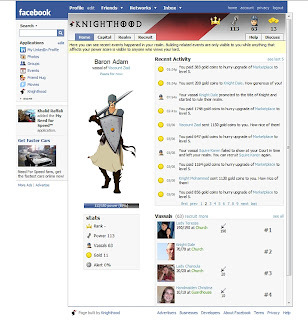 Sometime back I was invited to join KnightHood, one of the hundreds of applications on Facebook by one of my friends. I signed up for the online multi-player game but it seemed a little to complex and I promptly forgot about it. Quite recently, another friend was telling me about this "amazing strategy game on Facebook" and that's how I rediscovered the game. And after doing some research, quickly got into the thick of it. You start out the game as a Squire and then move up to become a Knight (or Lady), then a Baron (or Baroness), a Viscount (or Viscountess) and so on. So far the highest ranked player is a Duchess Marina . To get started, you recruit your friends as your vassals. You then go ahead building, expanding and upgrading new buildings including Castles, Marketplace and Walls among others. Building a Marketplace will being generating gold, which can then be used to hasten the construction and upgrade of other buildings including your defences, namely, Wall, Watchtowers and Pallisade. I was released by my leige who said that I was pushing up his attack bracket and I thus became a "Sovereign". I was loosing too many Vassals and decided to disband my troops and went into peace mode (no one can attack me in this mode nor can I attack anyone else while I build up my defences. There were some interesting offers on the discussion boards. One guy was offering 10000 gold per week or 1000 gold everyday to join him as a vassal with the freedom to be released any time. This sounded good with me and I became his Vassal. I will be gathering back my armies as soon as I finish building the dreaded Trapper. Don't be surprised if you find the servers down once in a while. The game is still in Beta. Yeah! I am really into this game. PS. Neewbies! I suggest you go through the KnightHood Wiki Help site before you start playing. r u kidding? is it really that good! I suggest you go through the FAQs before you start playing otherwise all the bad guys are going to loot and steal away all your vassals. Skip: It's been a few months now.